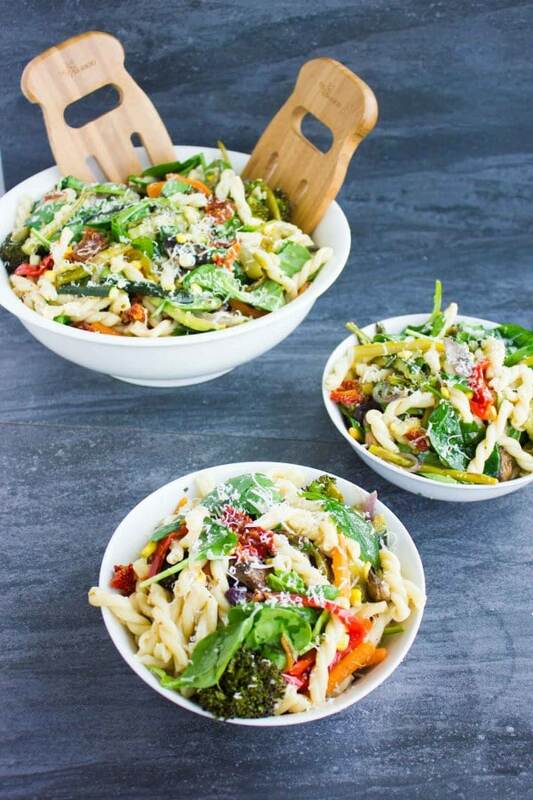 This roast veggie pasta primavera recipe is pure pasta and veggie bliss. 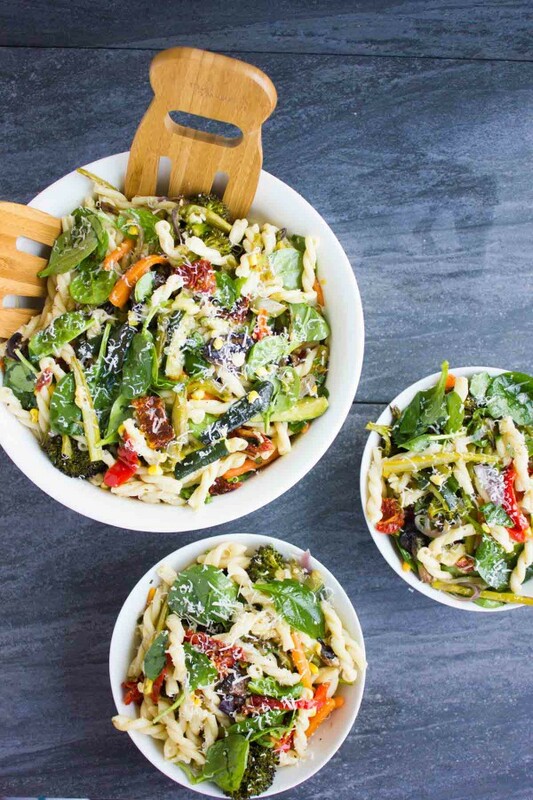 Sweet roast veggies are tossed with a fragrant mixture of garlic, basil and sun dried tomatoes, and then tossed with cooked pasta and parmesan cheese for an instant pasta sauce. 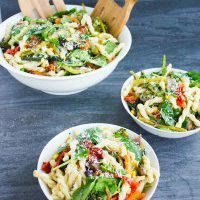 A gorgeous vibrant and perfect side or vegetarian main dish that’s loaded with flavor, color and veggie goodness! It’s no secret I have a thing for pasta, it’s like the ultimate comfort and unwind food. I might have made too many, way too many of it that it became my go to comfort dinner, or it could be a universal thing? If you’re in any way connecting with what I’m saying, this recipe is one you can’t miss! And if you’re not feeling the pasta love as much, I promise you this recipe will bring you a lot closer! 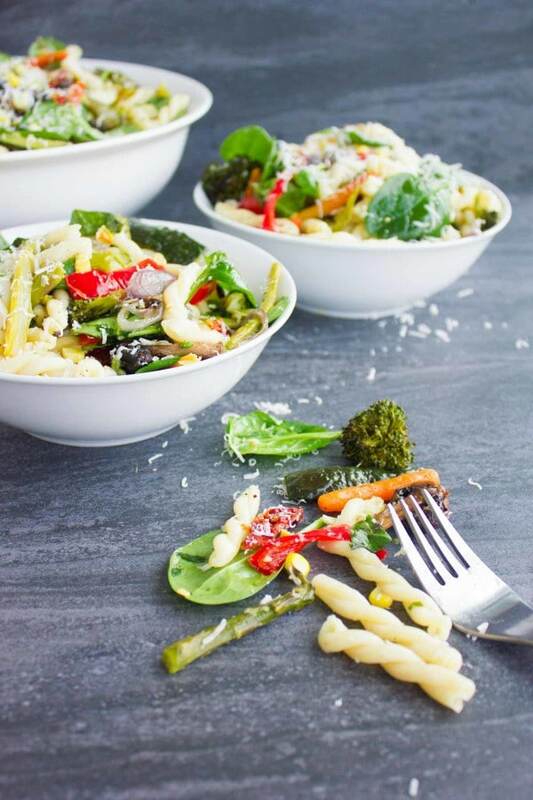 This roast veggie pasta primavera is very much an Italian classic, primavera means Spring in Italian and it’s loaded with beautiful Spring veggies and colors. 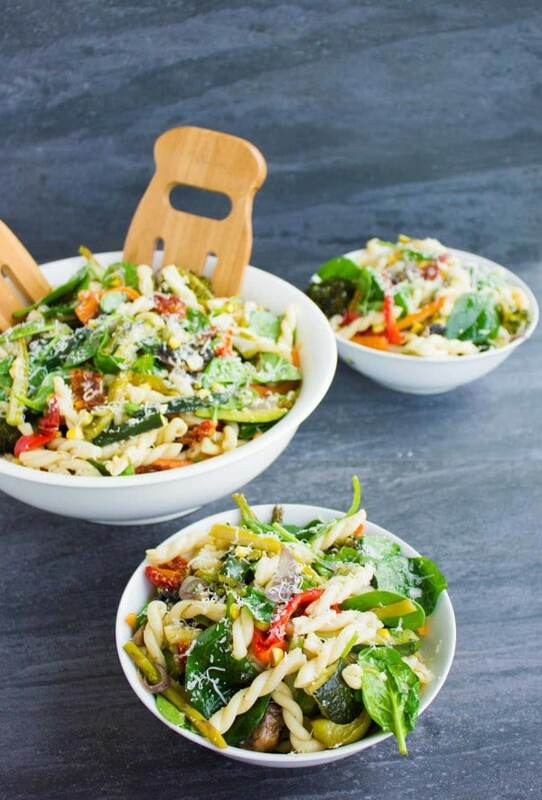 Even though we’re well into Summer, the gorgeous colors and flavors of this pasta fit right in. And while I used as many Spring veggies here as I could, this recipe is great with as little or as many as your heart desires. So don’t be discouraged if you feel you don’t have enough veggies, because the sauce will make any veggie shine. I love to roast my veggies for my pasta primavera, but they could be blanched, boiled, sautéed or each veggie can be cooked separately and differently form the other. I prefer slicing them all and tossing them with a little olive oil, salt, pepper and dried oregano and simply roasting them till tender sweet veggie perfection. The spinach is the only veggie I love using fresh without cooking because it wilts and softens the moment it’s tossed with the roast veggies and pasta. If you have a thing for kale, try it instead of spinach or a combo of both—I often do that. 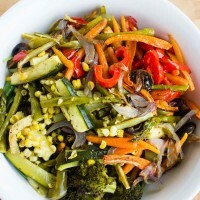 Now the secret that brightens up the flavors in this roast veggie pasta Primavera is the sauce. And the beauty of this sauce, not only that it’s refreshingly yummy, is that it’s a no cook sauce! 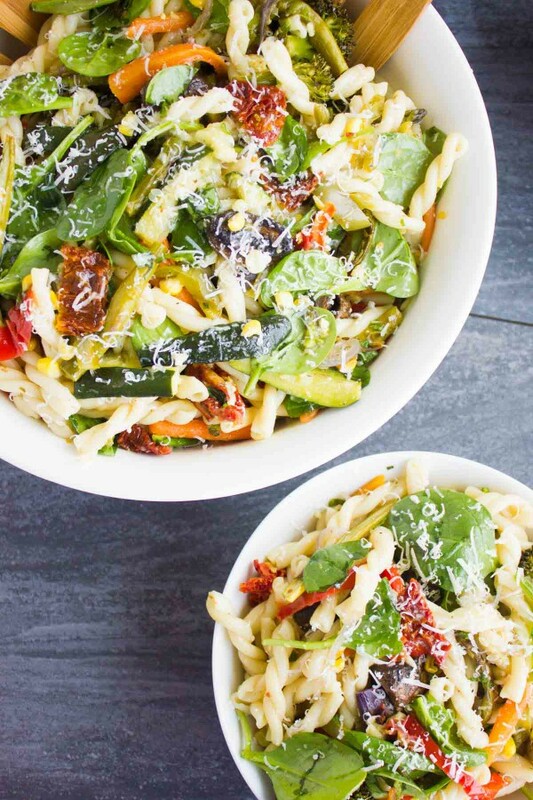 It’s a combination of fresh vibrant ingredients like garlic, sun dried tomatoes and fresh basil that are tossed with the roast veggies, so the heat from those veggies bring up the wonderful flavors and aromas of these ingredients and together they create a luscious sauce with a bit of the pasta water and Parmesan cheese. If you’ve missed the 10 minute Greek cheese tortellini recipe where I wrote a lot about the pasta water sauce, in brief, you can use the same water you’ve cooked your pasta in to make a base for the pasta sauce. So when you strain your pasta, make sure to save some of that starchy pasta water aside. 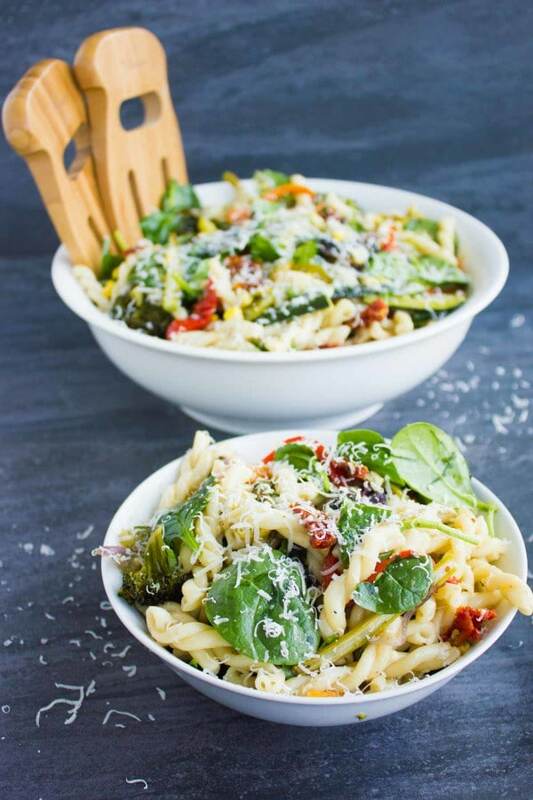 And together with a bit of cheese and aromatics (like the garlic, sun dried tomato and basil in this case), this pasta water creates a luscious sauce that feels like a creamy sauce while in fact it isn’t. I admit I do cheat a little and add a couple tablespoons of cream cheese to give an extra creamy feel, but it’s totally optional. Now if a creamy sauce is what you’re looking for, then substitute part of the pasta water with cream, or the entire amount like in this healthy kale squash mushroom pasta. Line a large baking sheet with parchment paper and preheat your oven to 400 degrees. 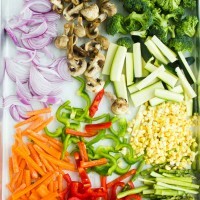 Place the veggies on the baking sheet and divide the seasoning between all veggies. Season with the salt, pepper and oregano then drizzle with the olive oil. 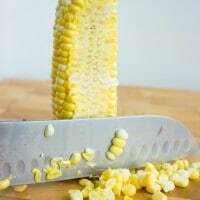 Toss the veggies with your hands to make sure all is evenly coated. Roast the veggies (except for the asparagus and broccoli florets) for about 18 minutes, tossing them halfway through baking. In the meantime, start cooking the pasta according to package instructions. Remove the baking sheet and make room for the asparagus and broccoli florets, then return it back to roast for just 3 minutes. 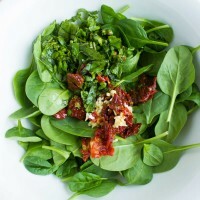 When veggies are done, place them all in a large deep bowl and add to them the spinach, garlic, sun dried tomatoes, cream cheese and basil. When pasta is ready add it all to the bowl too and add about 1⁄4-1/2 cup of pasta water to it and toss everything together. Add the parmesan cheese and toss again. Serve and sprinkle with extra cheese. 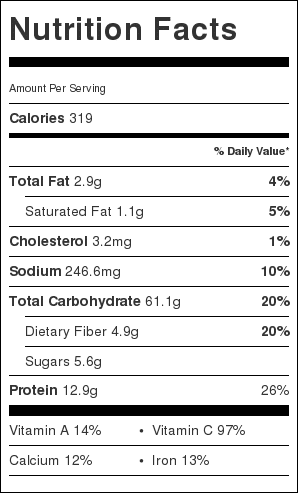 This was really good, do add the cream cheese. Also added red chili flakes for some heat Even reheats well the next day.